This really is the best Peach Cobbler I’ve EVER had (I finally, finally perfected it) and it will be my go-to recipe from here on out! 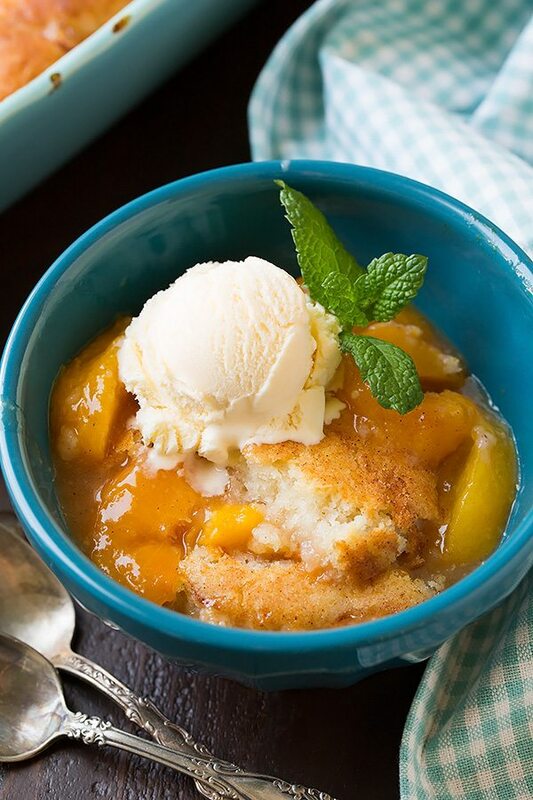 Learn how to make peach cobbler, you’re sure to love it with all those fresh peaches and that fluffy cake-like topping! Is anyone else going overboard like me and buying peaches like there’s not tomorrow? This June I’ve bought 20lbs+ in the last few weeks and we’ve been eating them like crazy! 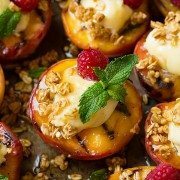 They make the best smoothies, they are one of my favorite fruits for baking, and they’re even excellent added to your main dish (like this Three Cheese Peach and Prosciutto Pizza with Basil, or this Balsamic Peach Chicken Skillet, and this Peach Salad with Grilled Basil Chicken). 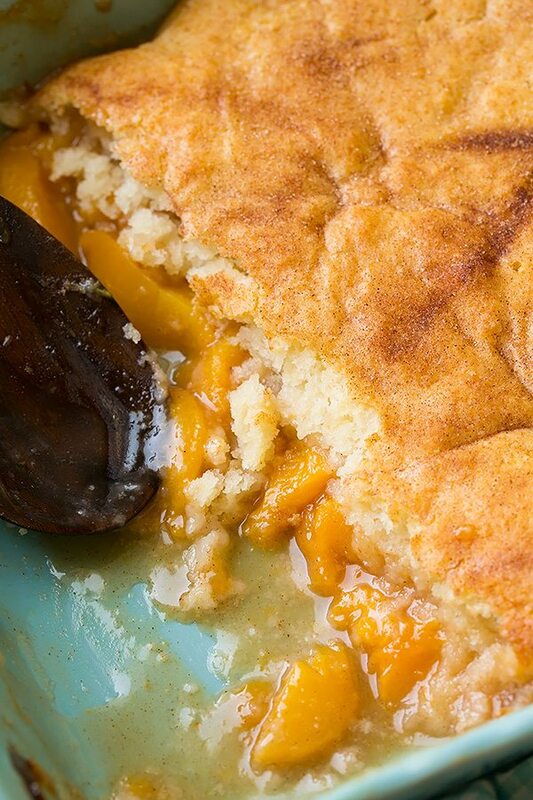 But we all know one of the all time best uses for fresh peaches is peach cobbler, right? And not just any peach cobbler – THIS peach cobbler! 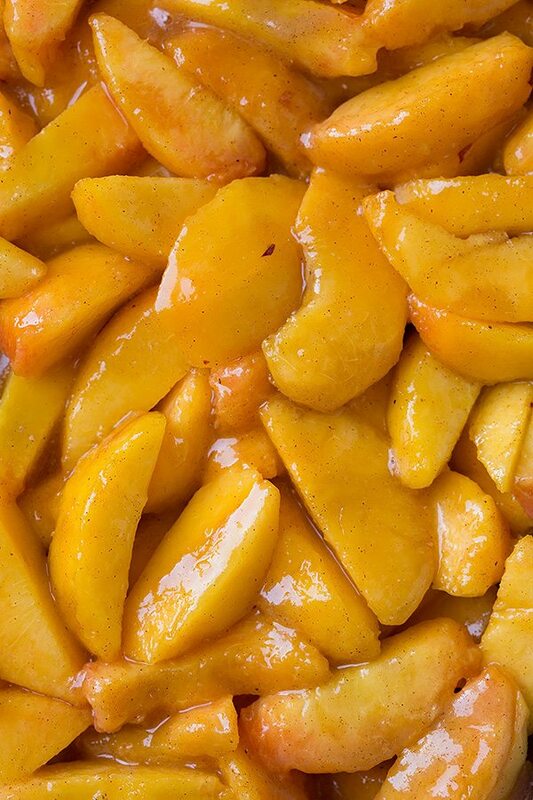 What Makes the Best Peach Cobbler? This is my all time favorite peach cobbler recipe and all of you need to try it! I’m very particular about my peach cobbler. 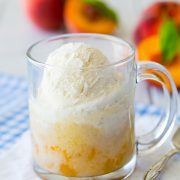 I don’t like a heavy, dense topping, I don’t like it with canned peaches – fresh peaches are a must. I like more flavor than you’ll find in your traditional peach cobbler (hence why I’ve used buttermilk, a fair amount of butter and vanilla extract), and I definitely don’t like when there’s an overpowering amount of cinnamon. So, with all those “don’t likes” here you’ll find in this recipe everything I love about a good peach cobbler. This may not be as easy as the version with canned peaches and a cake mix topping but I’d still consider this an easy homemade cobbler recipe. Nothing too difficult, it’s still a straight forward easy to make dessert. This really is the best peach cobbler I’ve ever had (I finally, finally perfected it) and it will be my go to recipe from here on out! I’ve tried many different variations of peach cobbler over the years and the one I sort of favored was a cake mix version because it had a lighter, fluffier topping. Well we all know made from scratch is best, so I set out to make my previous peach cobbler better without a mix, and this is what I’ve come up with. Chances are I’ll never make a different peach cobbler recipe again! It’s this one for life. This peach cobbler will definitely be the highlight of any summer dinner and you’ll get requests to make it again and again! It make take time to peel all those peaches but the end result is so worth it! Put your fresh peaches to good use and make this irresistible peach cobbler this week! Preheat oven to 375 and grease baking dish. Add peaches to baking dish, toss with lemon. Whisk sugar, cornstarch, cinnamon and nutmeg then toss with peaches. Make the toppings – whisk dry ingredients (sift cake flour first). Cut butter into dry mixture then mix in buttermilk vanilla mixture and stir just until combined. Dollop batter over peach layer. Sprinkle with cinnamon sugar and bake until set. The best peach cobbler ever! Filled with fresh, sweet juicy peaches and topped with a fluffy, buttery cake-like topping. A must on the to-do list every summer. Ditch the canned peaches and cake mixes and use this fresh from scratch recipe instead, it's 100 times butter! Butter a 13 by 9 by 2 3/4-inch baking dish then pour peaches into baking dish and toss with lemon juice. In a small mixing bowl whisk together 1/2 cup sugar, cornstarch, 1/2 tsp cinnamon, and the nutmeg. Sprinkle sugar mixture evenly over peaches then toss to evenly coat, set aside. Sift cake flour into a large mixing bowl then add in all-purpose flour, 3/4 cup sugar, baking powder, baking soda, and salt and whisk 20 seconds. Cut butter into flour with a fork or pastry cutter until it resembles coarse meal then make a well in center of mixture. Mix vanilla with buttermilk then pour buttermilk mixture into well in flour and stir with a spoon just until combined (don't over-mix, it should be lumpy). Dollop and just lightly spread spoonfuls (I did 12 across the top) of the mixture evenly over top of peaches (it will seem like there's not quite enough but it will bake up nice and fluffy and fill up the pan). Whisk together remaining 1 Tbsp sugar with 1/2 tsp cinnamon and sprinkle evenly over top. Bake in preheated oven until topping is golden brown and set and and filling is bubbling well, about 40 - 45 minutes. Remove from oven and let cool several minutes before spooning into bowls. Serve with vanilla ice cream. *More all purpose flour can be substituted if you don't have cake flour. Just use 1 1/2 cups all-purpose flour total.